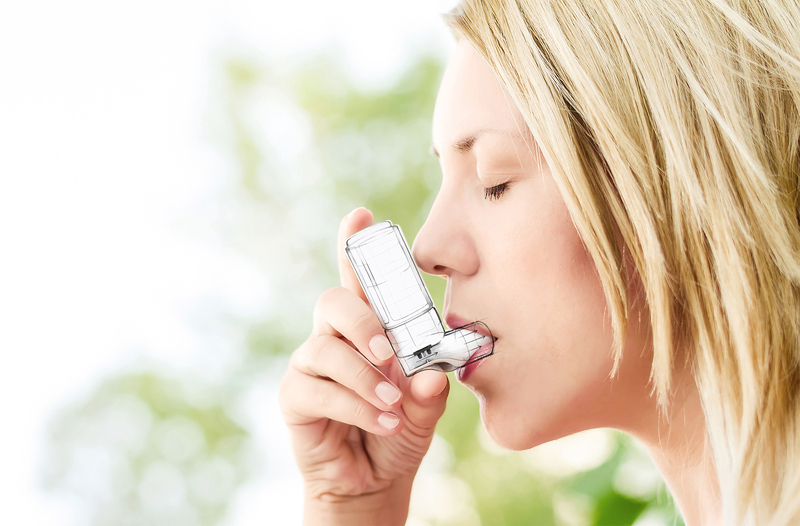 Industries with exacting demands, such as automotive and medical technology, have recognised that microthermal gas flow sensors give their products decisive advantages. These manifest themselves in high long-term stability and precision even when flow rates are minimal, and the sensors’ suitability for cost-efficient and reliable mass production. 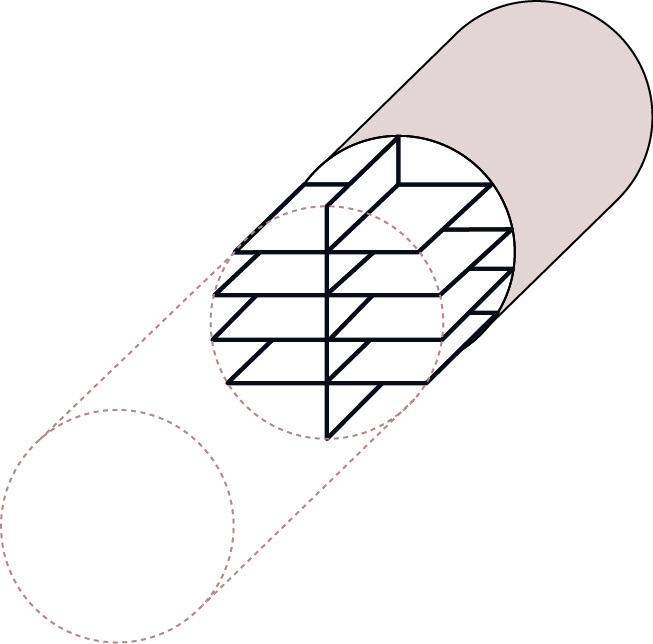 Consequently, measuring techniques based on thermal principles are widespread. In the simplest of these – the hot-wire anemometer – gas flow is determined via the rate of cooling of an electrically heated wire with a temperature-dependent resistance. Advanced methods use a heating element and at least two temperature sensors, which measure the transport of heat through the gas (see Fig. 1). We refer to the term ‘microthermal flow sensors’ when the sensor components are integrated into a millimeter-scale silicone microchip. For many applications, microthermal sensors bring decisive advantages. The small size of the sensors and the use of standardised semiconductor manufacturing processes enable mass production with a consistently high quality. And thanks to the economies of scale, unit costs remain moderate. Modern sensor elements deliver superior precision compared to classic hot-wire anemometers, while a glass coating of the sensor element provides corrosion-resistance. All these advantages are enormously useful in various branches of industry. Over the past decade, leading industries have moved towards microthermal sensor technology for gas flow measurement, which is now the predominant sensor type used for demanding automotive, medical and HVAC applications. A good way to tackle such challenges is to place the sensor chip in a bypass. An orifice, a Venturi or another flow restrictor generates a pressure drop, which guides a small proportion of the gas through a bypass channel (see Fig. 2). While the microthermal flow sensor guarantees high accuracy, reproducibility, and stability, particularly in the case of very low flow rates, a well designed pressure drop element ensures that the resulting differential pressure is less susceptible to changes to the inlet conditions. Also important is the arrangement of the bypass inlet. By using inertia effects and minimising the bypass flow, an intelligent tap design will ensure a clean gas flow to the sensor chip. Using a bypass configuration helps to simplify the manufacturing process too. It allows for the flow element to be moulded and assembled independently of the sensor. Under the premise of tight production tolerances and by positioning the pre-calibrated sensor at the end, it is often possible to forgo final calibration of the entire system. The flow restrictor’s job is to slightly increase the resistance in the gas flow and, as a result, generate a differential pressure. Physically speaking, this happens in two ways. First, friction between the gas and the flow restrictor’s surface areas (surfaces parallel to the flow) leads to a pressure drop that increases linearly with the flow. Secondly, end faces and their edges create turbulence and thus a drop in pressure which increases quadratically with the flow. In practice, flow restrictors are always a mix of the two types and thus their pressure/flow characteristics are always a combination of linear and quadratic components (see Fig. 3). Which of the two characteristics prevails is determined by the design of the flow restrictor. Usually a linear characteristic is preferable because it increases sensitivity at small flows, stabilises the zero point, and decreases the pressure drop at high flow rates. Therefore, as a general rule of thumb, a pressure drop element should have as much surface exposure parallel to flow as possible and a smallest possible cross section area. Classic circular orifices are not particularly well suited to the job; honeycomb structures are ideal, but expensive. An arrangement of blades, as shown in Fig. 4, has proved to be a simple yet suitable design. It can be easily produced using injection moulding and its flow/differential pressure characteristic tends to be close to linear. Thanks to inertia, most dust particles stay in the main channel. This desired effect can even be significantly improved with a good tap design. The inlet channel of the bypass should face backwards so that the gas needs to reverse to reach the sensor. It has also been noted that flow guides next to the tabs keep the flow stable and laminar and thus reduce sensor signal noise. And, eventually, the tap should be small, ideally with a diameter of 0.6 mm (see Fig. 5). Even though flow measurement using a bypass configuration is less sensitive to changes in the inlet conditions, it is still important to design the inlet path with care. Ideally, there should be no sharp bends or edges in the pipe directly upstream of the flow element, and no abrupt changes in the pipe diameter. Apart from that, some form of resistance to the flow (such as a sieve), just upstream of the main flow restrictor and evenly distributed across the entire diameter of the pipe, can help to stabilise turbulence and other undesired influences. With the right sensor, flow measurement in bypass is the most reliable and economical method. Microthermal differential pressure sensors, such as those made by sensor manufacturer Sensirion, are ideally suited to fulfil the requirements for several reasons. * The components are small, which helps to keep the size of the bypass small and thus reduces the space required for flow measurement. * Flow-based thermal differential pressure sensors have a high level of sensitivity and are very stable at around zero. It is thus possible to achieve a very wide measurement range (high dynamic range or high turn-down ratio). * Despite the thermal flow measurement method, the sensors are calibrated to measure the applied differential pressure. The sensors can thus be replaced and exchanged without recalibration. * Sensirion offers a specific temperature compensation geared towards flow measurement in bypass (see further information at the end of this article). The latter two points offer a further advantage. In many cases, provided that the main channel has a good design and meets specified production tolerances, there is no need for final calibration of the entire system. The fact that sensors are supplied calibrated and temperature-compensated, and that tolerances in modern injection moulding are small, means that in many cases random testing of the pressure drop element will suffice. To measure gas flow with a high degree of accuracy and repeatability, while at the same time keeping costs low, a bypass or differential pressure solution is generally most favourable. 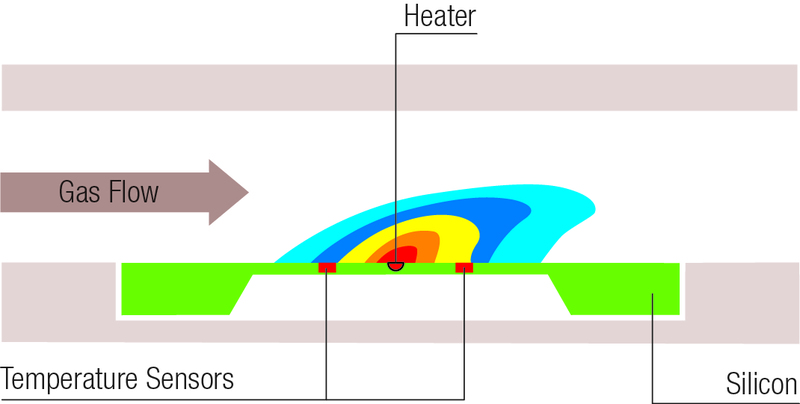 Compared with direct flow measuring techniques, the effects of external conditions can be reduced, and the cleanliness of the gas around the sensor element significantly increased. Additionally, if we select a thermal differential pressure sensor, which offers high-level precision even when flow rates are minimal, measurements around the zero point are extremely precise. In many cases, having the sensor calibrated for differential pressure combined with a suitable temperature compensation will eliminate the need for additional calibration over the entire measurement range. The so-called mass flow temperature compensation of differential pressure sensors simplifies gas flow measurement using the bypass configuration. The integrated calibration is implemented so that the flow can be correctly measured over the entire temperature range. 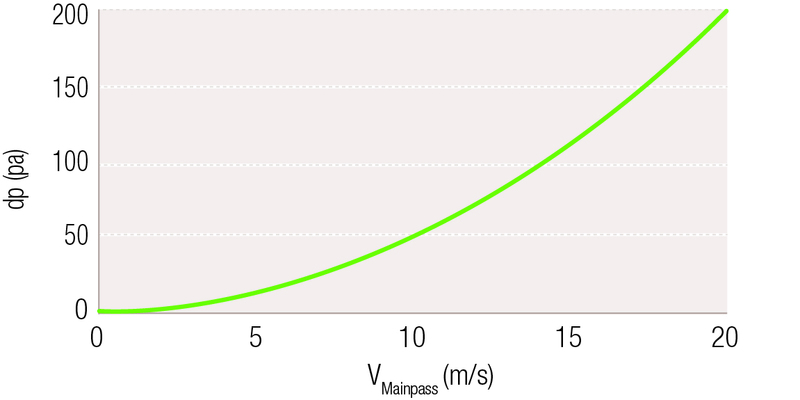 Consequently, no further temperature compensation is required for the conversion of the differential pressure output signal to mass or volume flow. The user is spared the complicated process of characterising the bypass system using several flow/temperature measurement points. The small size of Sensirion's new differential pressure sensor is its standout feature. The sensor measures a mere 5 x 8 x 5mm and thus opens up countless new applications. 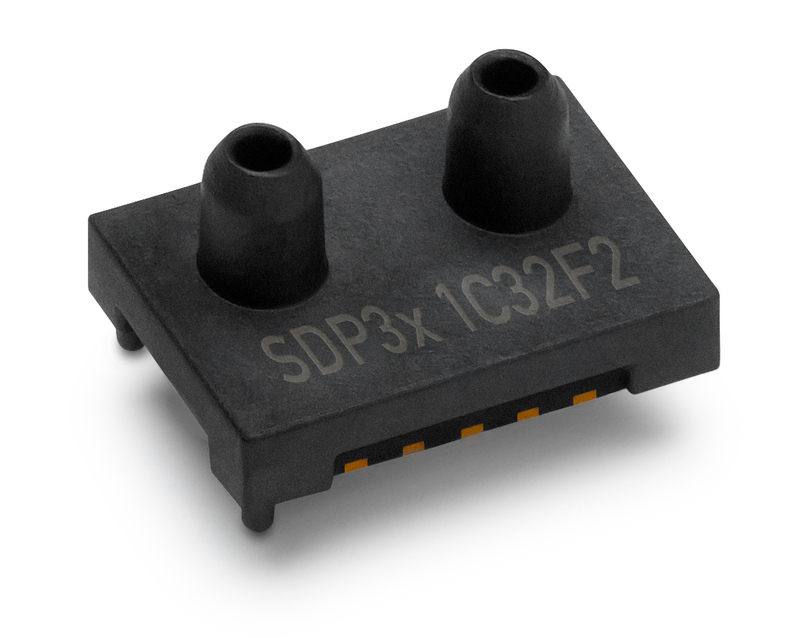 Like all Sensirion differential pressure sensors, the SDP3x comes with outstanding precision and long-term stability, together with no zero-point drift. Aside from this, it can be reflow soldered, offers new functions such as multiple I2C addresses or interrupt functions, and has a very fast response time of 2 kHz at 16-bit resolution. 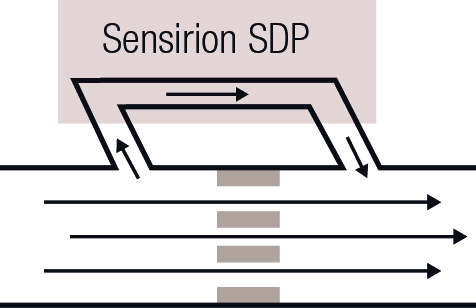 All these factors make Sensirion's new differential pressure sensor the perfect choice for high-volume but cost-sensitive applications. Andries Bosma is Product Manager Gas Flow/Differential Pressure, Sensirion AG.